Fine Artist & Graphic Designer, Painter, Sculptor, Animator, Illustrator, Muralist & more! 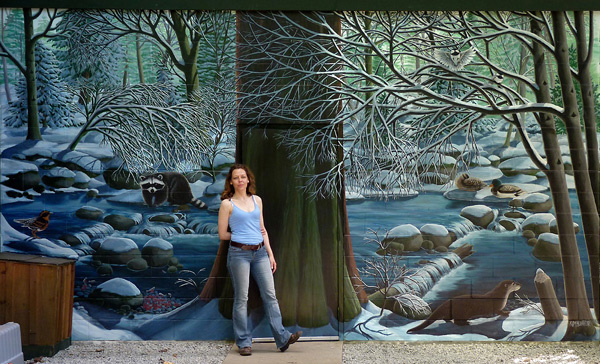 Contemporary Canadian Vancouver artist Kim Hunter a.k.a. INDIGO was born September 1970 in British Columbia. The ability to clutch a crayon was the beginning of an insatiable appetite for the arts. Kim has been winning awards and notoriety since her first juried art show at the age of seven. At the age of nine Kim Hunter's family was transferred to the tiny isolated community of Churchill Manitoba in Canada's north. The awesome and relentless arctic wilderness inspired this talent from a very young age. The long nine month winters allowed for this inspiration to flourish. By the age of 14 being entirely self-taught, Kim was selling her art, signing her work "Kim McTavish" to acknowledge her mother. At 18 she started travelling, selling her work and freelancing throughout Canada. In 1990, at the age of 20, she returned to her birthplace. Vancouver British Columbia has been the setting where Kim has forged a reputation worldwide. The passion and diligence of this remarkable talent speaks for itself. The collection of patrons and projects attributed to Kim Hunter's art collection is incredibly immense and diverse, covering a huge variety of disciplines, styles and mediums. Kim Hunter's artistic style is truly refined and unique in it's clean lines and forms. A warmth and richness graces all aspects of the artist's work. The balance and boldness of this contemporary Canadian artist's work is a perfect unique blend of traditions, culture and our modern times. Kim started signing "INDIGO" in 1995. The last few years Kim's focus has been on paintings, murals, portraits, commercial art, instruction and conservation through art efforts. This talented artist is versed in oils, watercolor, tempura, and acrylic paintings, clay & bronze, polymer sculpture, papier mache', Plaster of Paris, as well as web and commercial design, branding, animation, crafts and instruction. Kim discovered her Métis heritage in 2005 and her families direct Ascendance of the Canadian Historical Métis figure Cuthbert Grant. (see: The Battle at Seven Oaks 1816) The rich political history unearthed bore an uncanny resemblance to this artist's passion, generosity, diligence and devotion to art, conservation and community. Also see Kim's Eco-Art educational biography for more information on conservation and community efforts. Enjoy the vast collection of images by this talented artist, designer made available for your viewing pleasure.